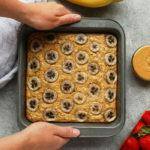 These Vegan Peanut Butter Banana Cookies are the perfect healthy recipe for a grab-n-go breakfast. 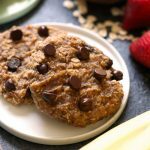 They are naturally sweetened with bananas, maple syrup and are packed with fiber from the rolled oats. The trick is to meal-prep a batch of vegan cookies at the beginning of the week and throw them in the freezer. 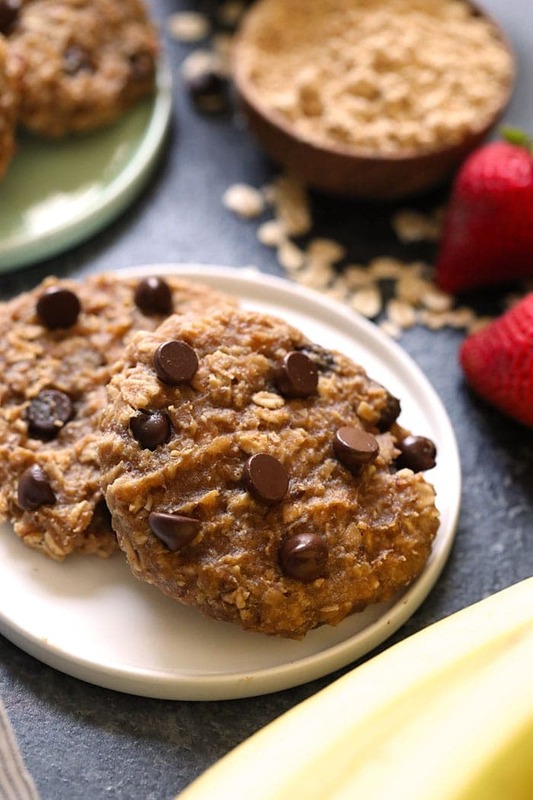 These healthy breakfast cookies are delicious with a morning coffee or tea. Try them now! We take cookies very seriously over at Fit Foodie HQ. It’s Linley here and we are talking all things breakfast cookies today. Did you ever have home economics in middle school (p.s. I just learned what “ec” in home ec stood for…ECONOMICS. Who knew?)? I had the best teacher and I absolutely loved home ec, because half of the semester you were in the kitchen. I loved every minute. I specifically remember our unit on healthy breakfast recipes. We learned how to cook eggs, breakfast bakes, and all of your normal breakfast foods. However, we also learned how to make breakfast cookies. I can still hear Mrs.Skjervold saying “Eating healthy is important, but even if you only have time for a breakfast cookie, fueling your body in the morning is essential”. 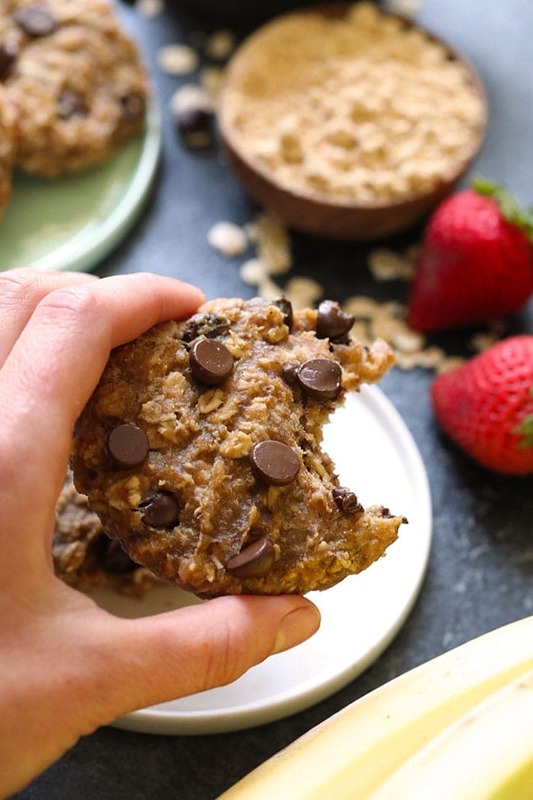 She taught us how to make healthy oatmeal cookies that would pass for a sweet breakfast option. Those words still ring true for me as an adult. When I fuel my body, even with just a little something, in the morning I have a much better day. Sometimes breakfast cookies get a bad rap, but I’m here to tell you that you CAN eat cookies for breakfast. All you need to do is make them with whole, healthy ingredients that will give your body fuel and satisfaction until snack time or lunch time! 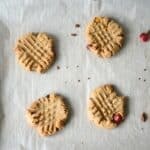 These Vegan Cookies are quite delicious, easy to make, are made with simple ingredients. I absolutely love when cookies have a bit of texture. 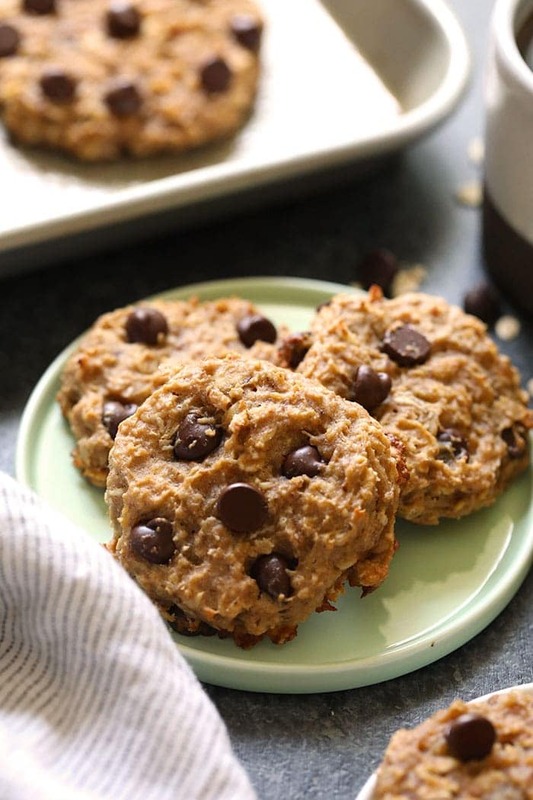 These healthy peanut butter banana vegan cookies are chewy from the oats and have the perfect amount of sweetness from the dark chocolate chips. We also decided to keep these cookies vegan, so get ready to mix up a flax egg! 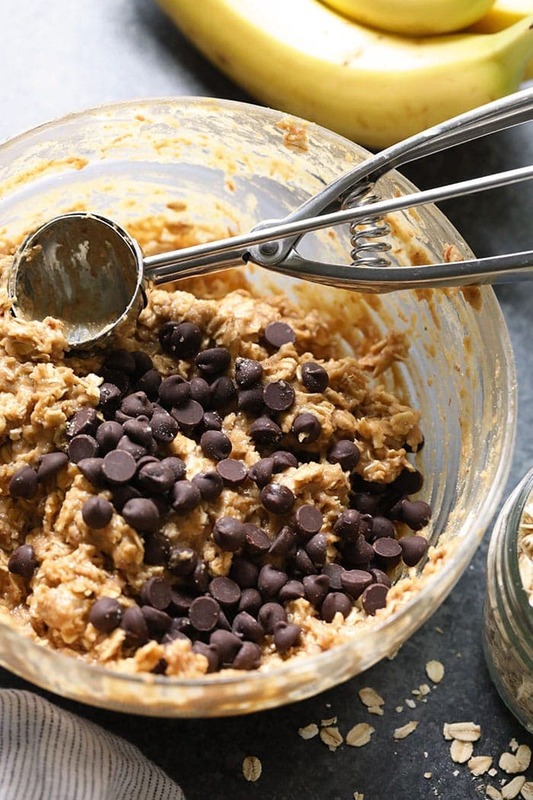 If you aren’t a fan of chocolate chips in the morning, try raisins or another delicious dried fruit! The beauty of this recipe is that you can make it your own by adding in different mix-ins or changing up what nut butter you use. Just make sure that whatever nut butter you choose is drippy! 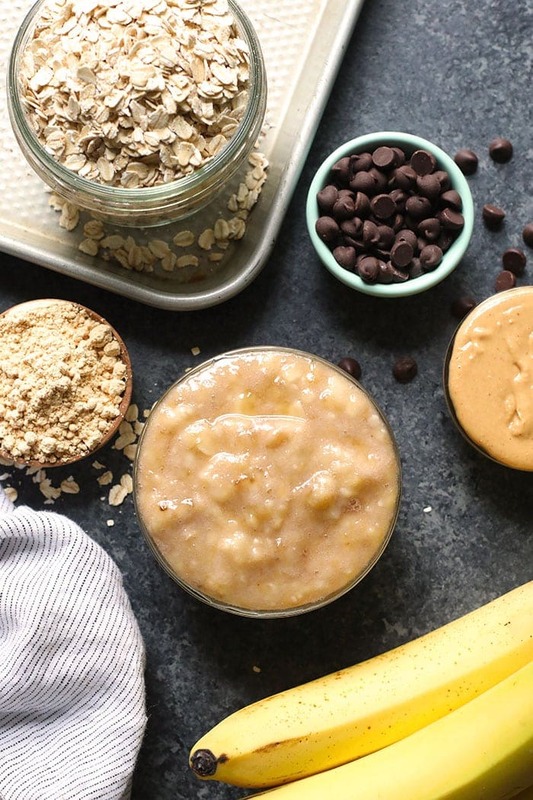 We are BIG fans of the chocolate, peanut butter, and banana combo so we generally stick with this classic recipe. 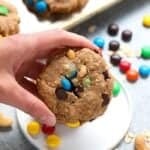 Now, make a batch of these delicious vegan cookies and throw them in your freezer for an easy healthy breakfast for the week! 2 Tablespoons coconut oil, partially melted. First, preheat oven to 350F and line 2 cookie sheets with parchment paper. Then, in a large bowl, mash 3 bananas. 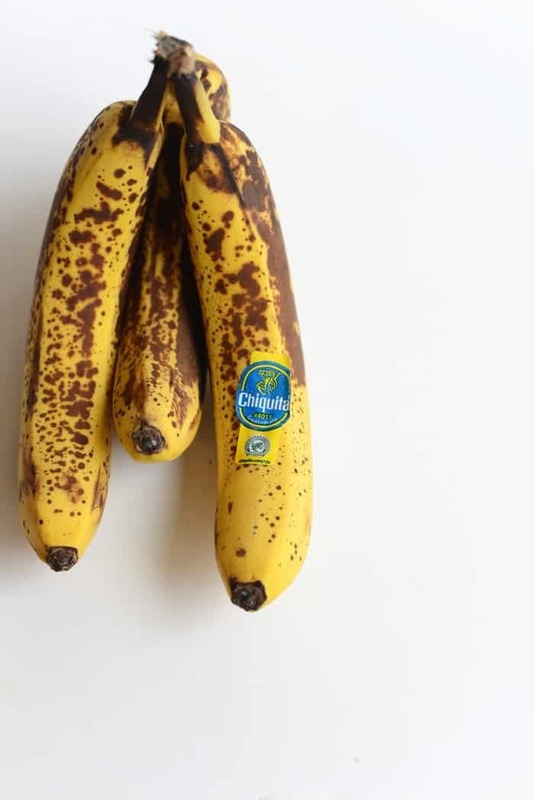 You’ll want your bananas to be very thin and runny. Next, add in vanilla, peanut butter, and coconut oil. Next, spoon 2 tablespoons of batter into your palm. Roll into a ball and place on cookie sheet. Then press into a cookie shape. These cookies wont rise or expand much. Repeat. Bake at 350 for about 20 minutes or until they begin to brown.